As I settle into the comfortable seat of my transfer vehicle to Monte Velho, I think back over the past three days and how far I’ve come since I stepped off the plane in Lisbon. 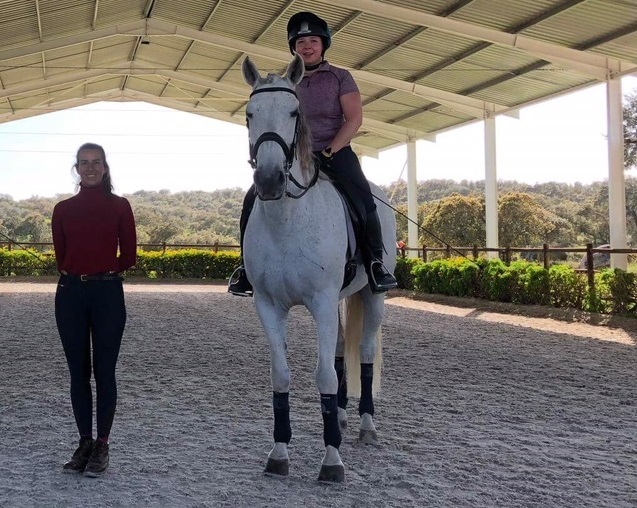 Despite being a million miles from becoming a dressage diva, the sense of trepidation I initially felt has eased and I am excited for what I will find upon arriving at Monte Velho. Diago, the transfer driver, is chatty and easily makes you feel at ease making the two hour journey fly by. The friendly welcome I received from the team at Monte Velho made me feel like a friend on a return visit despite it being my first time setting foot on the property. After a quick check-in I was shown to my room which was stunning. Every detail had been meticulously thought about from the beautiful bouquet of flowers on my bed, toiletries provided in the bathroom, the fluffy dressing gown hanging in my wardrobe and the most stunning view from my balcony. After a lunch of delicious local produce, I continued my explorations of this wonderful establishment. As with the rooms, the riders lounge has been designed to be stylish but welcoming with comfortable sofas and large windows that look out onto the pool. 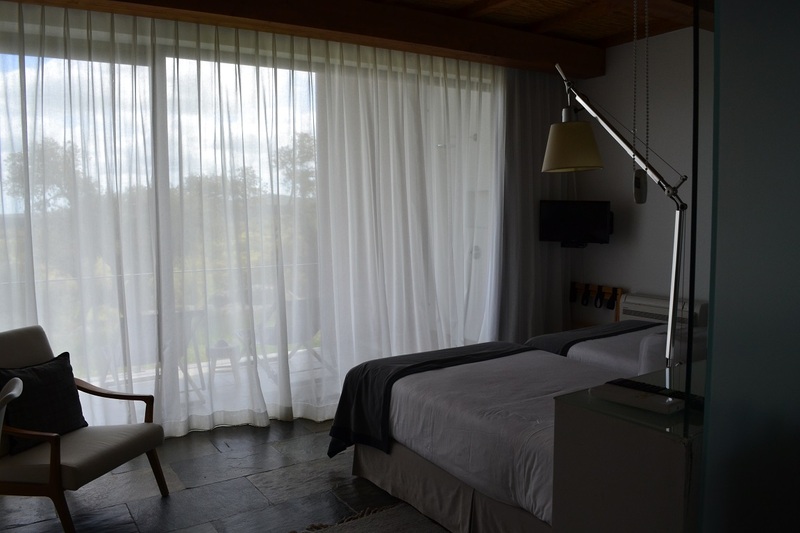 From here I have wonderful views of the lake, its surrounding countryside and into the paddocks of mares and foals. Further to my right is the newly built spa area full equipped with Jacuzzi, sauna, massage room and mini gym. From my spot on the terrace I could see lessons beginning in the large outdoor arena and so I made my way down to watch the masterclass going on below. I am of the belief that I learn just as much from watching lessons as I do on a horse and so I spent the next few hours absorbing as much information in preparation for my next lesson the following afternoon. Before I knew it, it was time to head back to my room to get ready for dinner, a wonderful selection of cheese, cold meats, pork chops, falafel followed by cake. An early night was in order to ensure I wake up fresh and ready to get my teeth into the next few days. After a quick breakfast of eggs, fresh fruit salad and yoghurt it is time to once again don my jodhpurs and riding hat and dive back into the challenging world of dressage instruction. Far from being thrown in the deep end and straight into a lesson, I am joined by Diogo, the owner of Monte Velho, and venture out on a trail ride. Getting to grip with traditional Portuguese saddles was definitely the first challenge of the day but my wonderful trail horse, Zelador, makes it seem easy. Trotting and cantering our willing steeds through the wonderful Altentejo countryside, I am in my element. Diogo is a brilliant guide, he makes sure I know of Zelador’s quirks and that we are all happy and comfortable throughout the ride. The hour and a half flies by and in a flash we are heading back into the stable yard. With another Trail ride scheduled for the next day it’s “see you tomorrow” to our wonderful greys. After lunch it was time to put myself back out of my comfort zone and head down to the stables to meet my handsome steed for the next hour. It was here that I was introduced to Zig Zag, a tall grey who would be looking after me over the next few days. My first instructor, Annie, told me that he was a very gentle schoolmaster and safe with the knowledge that I would be totally looked after by this wonderful horse I was actually excited to get started. After warming up and getting a feel for Zig Zag, we began working on the basics of flexion and bend with the aim to improve leg yield and shoulder in. With his buckets of patience over the next two lessons we’ve cracked it and had made some real progress which I couldn’t wait to take home and work on with my own horse. Between my lessons and trail rides there is the opportunity to watch other lessons and the instructors working with the younger horses. 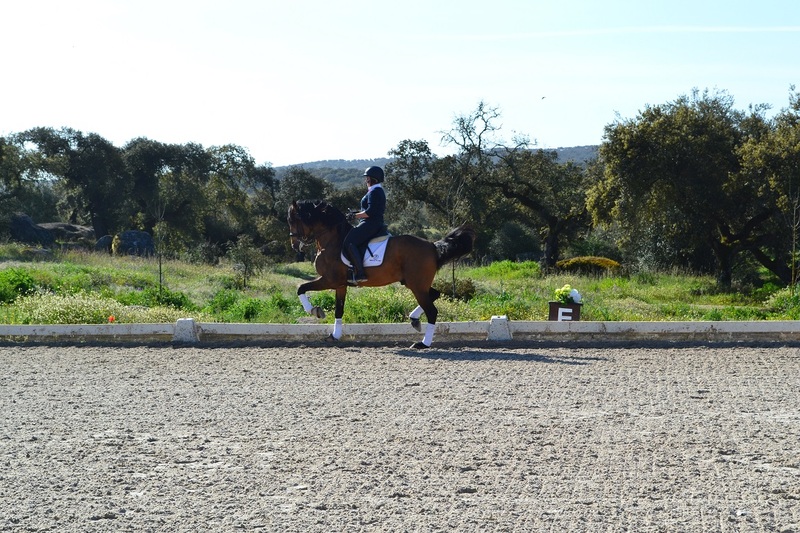 It’s amazing to see the patience and knowledge that the instructors, Coralie, João and Annie show in their own riding. The horses are gently and sympathetically worked and brought on without force. With regular encouragement and rewards from their rider the intelligent Lusitanos quickly pick up what they are being asked to do. 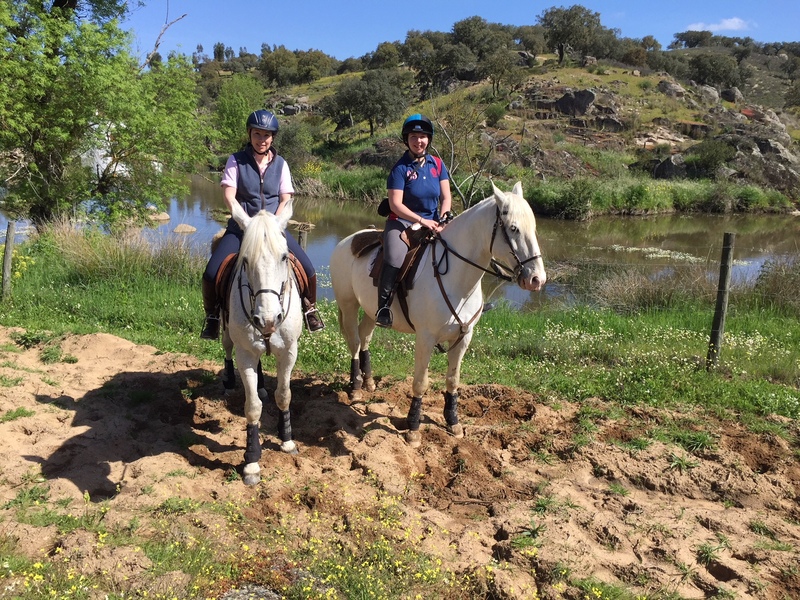 With a trail ride to finish off a wonderful few days in the glorious Alentejo countryside it is with great sadness that I say goodbye. I can completely understand why guests return again and again to Monte Velho. 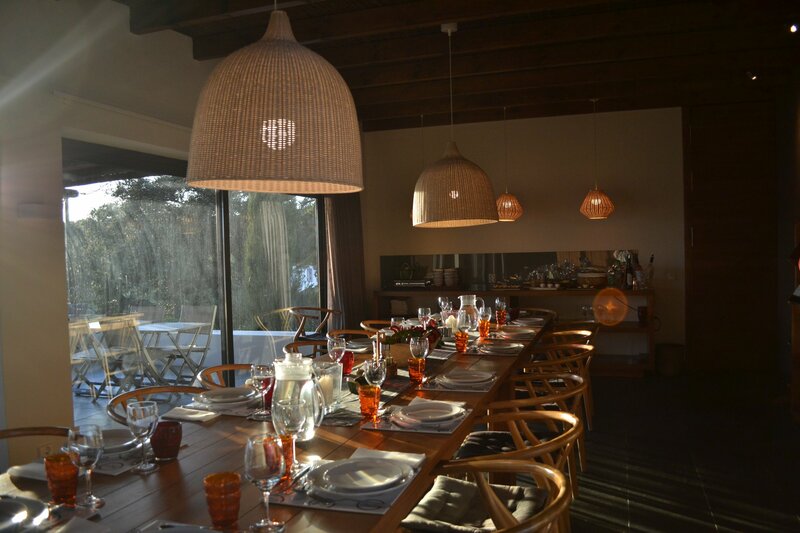 With incredible food, luxury accommodation and lovely horses it is somewhere you very quickly feel relaxed and at home. It seems like no time at all since I was in the transfer vehicle on my way to Monte Velho and as I see it disappearing into the distance I realise that my time in Portugal is coming to an end. With the bit firmly between my teeth I am ready for Alcainca and the new challenges it may bring. 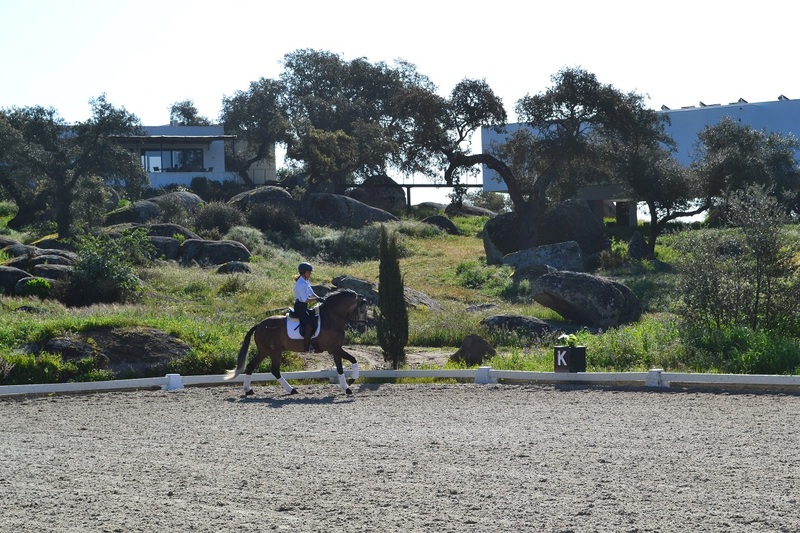 Follow my dressage adventure in Portugal as I travel to Alcainca here.